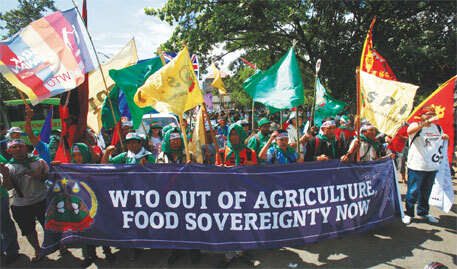 IN THE hoopla over the food stockpiling controversy at the Bali conference of the World Trade Organization (WTO), a “peace clause” doled out as a sop to some states seeking food safety nets for their hungry millions obscured the contours of a binding new agreement that signals another trade offensive launched against developing countries. Innocuously termed trade facilitation (TF), this pet project of the developed world was rammed through at the ninth ministerial conference in a victory that was clearly foretold. The agreement was reached on the back of a well-publicised study released by the Paris-based International Chamber of Commerce that claimed TF would push up global income by US $1 trillion and add a whopping 20 million jobs, of which 18 million would be in the developing world. The report was cited often by negotiators of the rich world but critics have questioned its “unwarranted assumptions” and flawed methodology. Particularly suspect are its figures of employment generation (see ‘Flawed study based on assumptions,’). However, industrialised nations celebrated their success in securing the TF agreement with hardly any quid pro quo as “the triumph of multilateralism”, leaving the developing world to pick through the remains of a negotiation that provided little comfort. The proposal of the G33 countries—this is a bloc of 46 WTO members with sizeable poor populations and small farmers—that it be allowed to stockpile foodgrains as a food security measure was met with minimal concession. This was a peace clause in that such schemes in existence could be in force for another four years till a permanent solution is found. Not unexpectedly, the peace clause brushed aside the long-standing demand of the developing countries for a thorough overhaul of the Agreement on Agriculture with its outdated methods of calculating the support price provided to low-income farmers (see ‘Fighting a flawed WTO regime,’ Down To Earth, November 30, 2013). India’s Commerce Minister Anand Sharma who went to the Bali negotiations with all guns blazing and the heroic declaration that there could be no compromise on the country’s food security was clearly grandstanding. India was under tremendous pressure from the developed nations, specially the US, who portrayed it as the sole stumbling block to a pact that would revive the comatose apex trading body. Sharma and his negotiating team had aided this perception by painting themselves into a corner. Not only did they manage to alienate some members of the G33, but also failed to take on board the worries of food importing countries in this bloc, such as the Philippines. India was also portrayed as being insensitive to the concerns of least developed countries (LDCs), which were supposedly one of the three main beneficiaries of the Bali agreement. But as quite a few trade ministers concede the LDC package, which was used to isolate India and the G33, there was nothing but another set of best endeavour promises. These relate to preferential rules of origin for export to industrialised countries duty-free and quota-free market access. 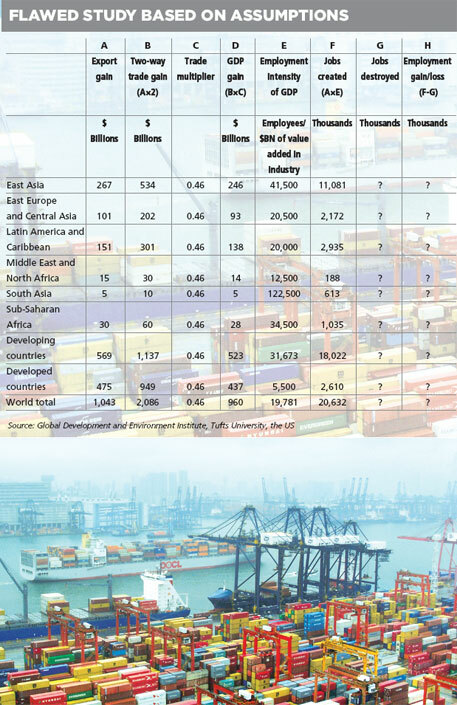 Although India and China are expanding preferential access for LDCs, many developed countries are yet to do so. Biswajit Dhar, director general of Research and Information System for Developing Countries (RIS), a Delhi thinktank on trade issues, says: “What LDCs got were just platitudes. Many rich countries have not given any tariff and quota concessions although they had agreed to 97 per cent of tariff lines. India, on the other hand, has provided access to over 96 per cent of the goods.” He believes it is important to tell LDCs that they have gained nothing because of the perception that India was wrecking their chances by sticking steadfastly to the food stockpiling issue. With this backdrop it was not surprising the TF pact sailed through. On the face of it, developing countries should have no reason to cavil. The agreement seeks to streamline customs procedures by reducing red tape, bringing in more transparent operations and fostering customs cooperation among members. Primarily, it is intended to facilitate the rapid and smooth entry of their exports to the developing and least developed countries without the usual bottlenecks. TF was originally part of the Singapore agenda that rich nations had been pushing since the 1990s and was not part of the Doha Development Round until 2004 when it was squeezed in. The fundamental question is whether developing countries should be forced to spend more on improving their port facilities at the cost of expenditure on vital sectors such as healthcare, education. This could amount to colonial style infrastructure development under which a sovereign nation cannot prioritise its spending, points out an analyst. This is because the Bali mandate ignores the ability of developing countries to undertake TF given the competing needs for limited resources. India, for one, has already made significant investments on TF in the last few decades. Should it be spending more on computerising and streamlining its ports when it has yet to put its road network in order and is unable to ensure smooth movement of goods within the country? How will it assess whether its need for better TF is more important than other socio-economic needs, such as food security, water and sanitation? There are threats to national security as well, warns Nanda. For instance, under Article 11 of the agreement there is the issue of freedom of transit. Under this provision Nepal and Bhutan could very well demand a special corridor with 24-hour open borders to facilitate their trade. “This can prove suicidal for developing countries,” he says. The agreement calls for substantial commitments by developing countries even though there is some flexibility in implementation schedules. Although there is a provision that technical and financial assistance will be given to developing countries this assistance is not free and could even form part of the regular aid package. Besides, there is a clearly spelled out framework for such assistance that allows donor countries and international organisations to monitor the implementation of this support. A fundamental problem is that the study by the Peterson Institute of International Economics for International Chamber of Commerce (ICC), only takes into account the gross gains excluding the costs associated with implementing trade facilitation. The first source of inaccuracy in estimating the gains from trade facilitation is the measurement of trade facilitation itself. TF it points out comprises of a variety of dimensions, such as availability of information on the internet or homogeneity of documentation, that are typically measured on an arbitrary scale. Such indices of trade facilitation may be useful for understanding broad patterns but they hardly contain the information necessary to establish accurate correlations with other variables. According to Nanda, TF provisions are aimed mainly at helping foreign companies at the cost of domestic enterprises. One such provision is for temporary admission of goods. This would give an unfair advantage to multinationals that have contracts in India and will be allowed to bring in capital equipment without the payment of any duties. Such a facility will not be available to domestic rivals, he says. “Implementing trade facilitation reforms is a costly process, likely requiring teams of specialised personnel and, in many countries, large international consultancy fees. This requires diverting resource from other services such as healthcare and education,” says the Tufts University report. “Although it is reasonable to expect that trade facilitation would lead to higher trade flows, there is no indication of large net benefits. The US $1 trillion increase in global income estimated by the ICC is based on too many unjustified assumptions to determine any policy changes.” Ditto for the 18 million jobs promised in developing countries. In the final analysis, TF is not the win-win pact that the Bali ministerial makes it out to be. It is hard to say why TF should become any developing country’s policy priority, much less for LDCs. After the triumphalism of Commerce Minister Anand Sharma and his cheerleaders, it is time for some sober appraisal of the outcome of WTO’s “historic” agreement at the Bali ministerial. Who lost and who won? The biggest losers undoubtedly were the least developed countries (LDCs), 34 of whom are WTO members. None of their concerns, such as the hugely trade distorting cotton subsidies by the world’s biggest trading giants, the US and the EU, was resolved. But there was a promise yet again of “pursuing progress in this area”. The issue was first raised in 2001 but the Bali meeting merely expressed regret that members had not made good on their 2005 promise made at the Hong Kong ministerial to eliminate these subsidies which have nearly destroyed the economies of Benin, Burkina Faso, Chad and Mali. India and the G33 claim to have made gains. Here’s what they wrested after a tough fight: a temporary reprieve of four years, until the 11th ministerial, to continue with their public stockholding or food grain procurement for food security purposes. Which means that they will not be taken to the dispute settlements body of the WTO for exceeding the cap of 10 per cent of agricultural production as subsidies as agreed under the Agreement on Agriculture (AoA). This cap or de minimis support is calculated on an outdated and flawed methodology based on the external reference price (ERP) prevailing during 1986-88. But the Bali pact did not agree to any change in the ERP although prices have shot up 650 percent since then. The peace clause of four years, until they negotiate a permanent solution, is however, available only to those countries that already have such programmes in place. The Bali agreement is silent whether the procurement schemes will be considered a violation of the Agreement on Subsidies and Countervailing Measures or ASCM. Possibly not, since the rich nations have yet again staved off an attempt to reform the highly discriminatory and unfair AoA which allows their humungous subsidies to continue. But in return developing countries will be monitored and they will have to comply with arduous data filing requirements that will provide minute details of how the subsidy is calculated. In addition, they have to ensure that “stocks procured under such programmes do not distort trade or adversely affect the food security of other members”. How will India comply with these tough requirements? What happens if no permanent solution is hammered out before 2017? WTO 9th ministerial: victory or compromise deal for India?